Folds Down to 4 x 8.75"
This full-color Cheat Sheet from PhotoBert is a small, comprehensive, fold-out guide for the Nikon D610 DSLR camera. It gives tips and descriptions for features and will help you learn about the functions of your digital camera. It is folded into thirds for a convenient carry size of 4 x 8.75". Additionally, its 3-mil waterproof lamination protects it from the elements for use in practically any weather condition. 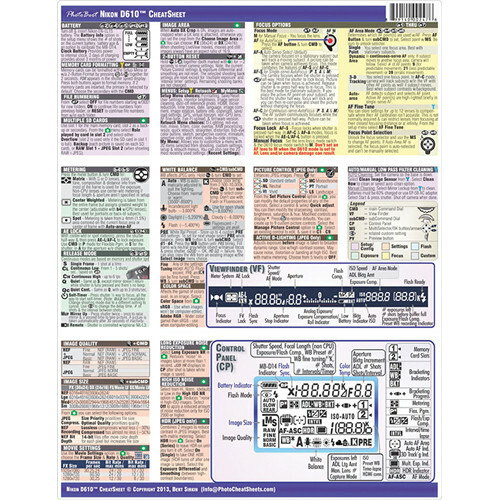 Box Dimensions (LxWxH) 8.8 x 3.9 x 0.02"
Cheat Sheet for Nikon D610 DSLR Camera is rated 4.8 out of 5 by 9. Rated 5 out of 5 by Thomas from Beats trying to remember this stuff I don't use my D610 every day, and even if I did, no way am I going to remember all the settings, options and features. This Cheat Sheet will be of much greater assistance to you if you first read the camera's manual. Then, the abbreviated reminders on the Cheat Sheet will illuminated a few light bulbs in the brain. About the size of a No. 10 envelope, I find this product to be a tremendous help when traveling, as my addled brain just cannot remember every conceivable option. Rated 5 out of 5 by SmokyMtPhotographer from Quick and Easy and Informative!!!! Even though the text is super tiny and you will need a magnifier -- it is a very useful cheat sheet to own. Rated 5 out of 5 by Anonymous from Should be part of the camera kit. This sheet was just as important as the camera purchase. It helped me learn more about my camera and how to use it in a short period of time. I still use the sheet when I'm out taking pictures or learning how to use the various settings on my camera. It's become part of the camera bag essentials and it's a lot smaller than the camera manuals! Rated 5 out of 5 by mackman from lots of short cut information super nice laminated card which folds to put in camera bag.lots of concise information about your camera. Rated 5 out of 5 by Manolo from Perfect guide for new photographers Very helpful quick guide! I use it on the go when I need to make quick changes to my settings! Rated 4 out of 5 by Harvey from Gives you a great idea of how your camera works. Gives you a very good idea of how you works in simple terms. Highly recommended. Rated 4 out of 5 by Richard from Very 'busy' card Has everything on it. Will have to get used to it-so much is on it.